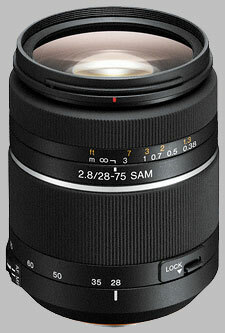 (From Sony lens literature) Sony 28-75mm f/2.8 SAM. A high quality, wide aperture zoom lens covering versatile range of focal lengths from wide angle to medium telephoto. Gives superb results with Digital SLR cameras using full-frame sensor. Smooth Autofocus Motor (SAM) for smooth AF operation. A very good travel lens on FF, excellent sharpness at center at all apertures, but somehow soft on edges, very soft at wide apertures, a bit less when stopped down. Color rendition is excellent, has a very good flare control, but vignetting is apparent (though fixable with processing). If you need to take just one lens for a trip, then this is quite a good choice. I wanted a prime 45mm for use on the Sony a-900 and was unable to find one . I checked the SLR GEAR lens tests for the Tamron 28-75 mm zoom and I was very impressed . I also discovered that the Tamron 28-75 mm f2.8 crosses the zero distortion very near to it's 45mm setting , so I decided to Buy the lens . The lens will focus , probably as well as any when using the autofocus mode . My problem is that I want very exact focus near the end of the format , and this does not offer any focus sensor so far fron the center of the frame . For a zoom lens I believe this lens is performing as well or even with more IQ than most prime lenses , even wide open it amazes . I bought this together with my Alpha 850. Sure its not the quality of the Zeiss 24-70 neither it has the wide angle of 24mm. It is a good standard zoom. I had the Minolta 28-75 on my A300. The 28mm were not appropriate on APS-C. On FF this is a complete different story. The price is insane, like lot of the Sony lenses.